Bring presence to the workplace to increase productivity and reduce stress, with our online classes and VR environments. Project Self Development provides teachings people can use to improve their lives through mindfulness, awareness and technology such as VR. Mindfulness is being recognised as a powerful tool for reducing anxiety and boosting wellbeing. This course not only teaches you effective mindfulness techniques but also provides ideal virtual environments for you to practice within. People are too focused on trying to change things externally in the hope that by doing so they will change how they feel internally. You’ve got to look at this from another perspective. When you improve your internal wellbeing, you approach the workplace in a different way which in itself massively improves the action you take allowing your external situation to flourish naturally. 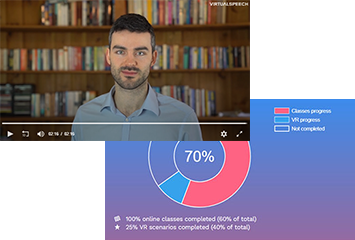 We combine online classes with VR for a unique learning approach. 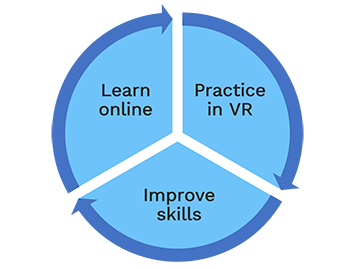 At certain points throughout the course, you'll be prompted to use our VR environments to practice what you've learnt. You'll complete a series of lectures and gain access to a number of different resources thay will significantly aid your mindfulness development. 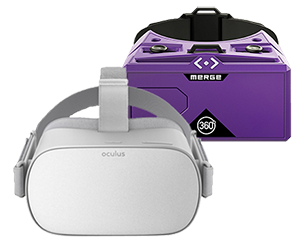 Practice what you learn with VR scenarios specific to this course. Developing your workplace mindfulness is just like any other skill - you need to practice to improve. Learn online, practice in VR and receive feedback on mindfulness techniques. This loop occurs multiple times throughout the course and helps you improve your workplace mindfulness more effectively. Users who have committed to the course have stated a significant reduction in their anxiety, both in stressful and everyday situations. Learn from the head coach of Project Self Development, who has spent years teaching people how to live in the present in the workplace. If you are able to stay in the present without letting unnecessary thoughts take over, then you are able to "zone-in" and be more productive at the office. Get the benefits of a retreat, including tranquil surroundings, immersive teachings and a distraction-free environment, from the comfort of your own home. 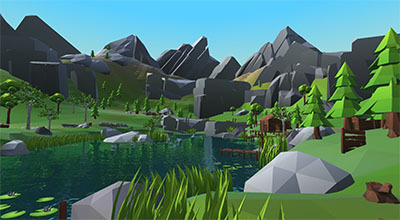 Practice mindfulness techniques in peaceful and beautiful low polygon environments. We’ll guide you to a state of constant calm that makes a huge difference to the quality of your life. 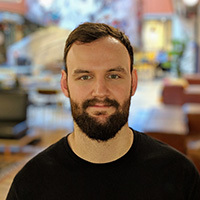 An introduction to this workplace mindfulness course, explaining how the VR experiences are integrated into this course and giving you the chance to explore one of the virtual environments. Organisation is key to a successful mindfulness journey – learn how to stay organised, the importance of sleep and using a notebook for everyday tasks. This module looks at why practicing mindfulness is beneficial, the issues with overactive thinking and how to approach the teachings in these lectures. 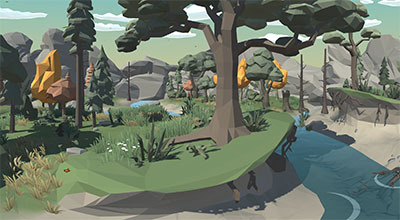 Practice different mindfulness techniques in virtual reality environments. You’ll learn fundamental techniques before entering the virtual scenarios and be guided through them with voice narration. We take you through more advanced mindfulness techniques, including an understanding of who you really are and your underlying awareness of yourself and space around you. Max has spent years learning about mindfulness and the power of living in the now. He now runs a popular YouTube channel on the topic and has authored two books based on mindfulness and meditation. Practice mindfulness techniques with one of the leading VR apps, downloaded by over 200,000 users. 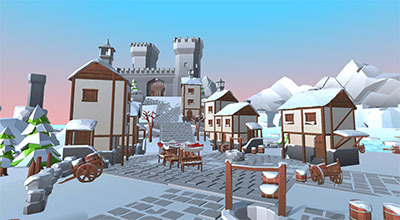 You'll be guided through a relaxing meditation in each of our virtual low-poly environments, from the calm and peaceful Autumn forest to the more thought-provoking Winter village scene. 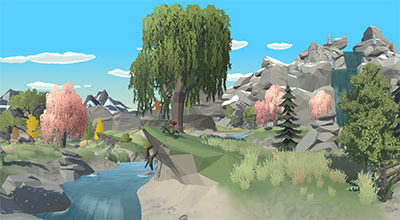 Develop your mindfulness skills in our beautiful low poly environments. You're guided through different mindfulness techniques in the VR scenes. Full online curriculum, access to all mindfulness scenarios in VR, meditation exercises and continually updated content.